SURPRISE RELEASE! 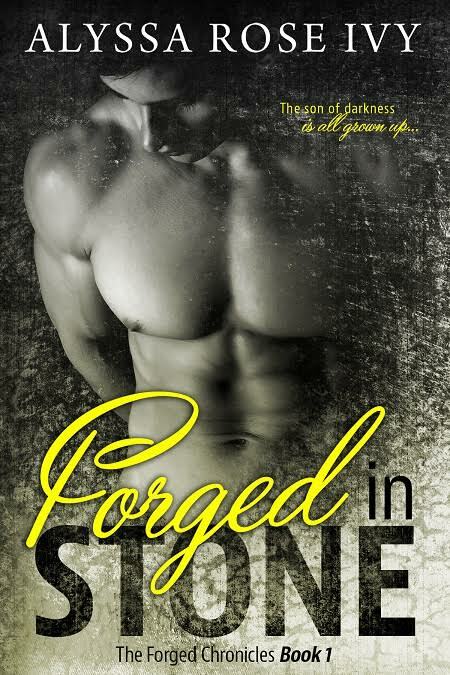 Forged in Stone by Alyssa Rose Ivy with Excerpt and Giveaway! Fans of Alyssa Rose Ivy’s, here’s a SUPER exciting announcement:FORGED IN STONE, Book 1 in The Forged Chronicles is here!!! That’s right! Alyssa Rose Ivy has released this New Adult Fantasy Romance TODAY! You can find an exclusive Crescent Chronicles bonus scene in the back of FORGED IN STONE! You are NOT going to want to miss this exciting, new series. Go grab your copy today! Hey everyone! I’m excited to announce the surprise release of Forged in Stone, the first book in a brand new NA Fantasy Romance series. I’ve been waiting to write this story for ages, and I’m so excited to finally share it with all of you. Although it’s fantasy, there are paranormal elements and it will eventually tie into the other Chronicles series. Fans of Levi and Jared will definitely want to meet James. When you are finished reading Forged in Stone, be sure to check out the bonus Crescent Chronicles short story in the back. I hope you guys enjoy James and Ainsley’s story! Check out the excerpt and enter the giveaway! There is an international giveaway for a choice of one signed Alyssa Rose Ivy title for one winner. Click here to enter! This entry was posted in Book News, Book Release, Books, Excerpt, Fantasy, Giveaways, New Adult, New Release, Romance and tagged Book news, Book Release, Books, Excerpt, fantasy, Giveaways, New Adult, New Release, Romance.